what is there to overcome? When watching a recent documentary about Serena Williams, this quote resonated. We all experience these feelings at different times; usually when we are moving through a time of transition. It is easy for us to try and fight against these feelings, to tell ourselves that we shouldn't be experiencing them... But nothing could be furtherest from the truth. Growth means to move beyond perceived boundaries. Like an explorer, we are stepping into unchartered territory. We are casting-off from the known and taking a leap of faith into the unknown. It is the space between the known and unknown that is the hardest to navigate. 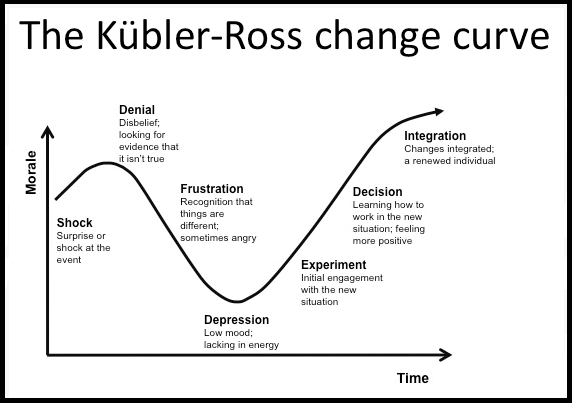 Kübler-Ross likened emotions felt during change with that experienced during a grief process. The depth of the dip and level of emotions experienced depends on how much of a change is being required of the us. It is when we cast-off from our safe-zone into the void that our fears, inner critic and self doubt speak the loudest. These thoughts and emotions try to send us back to safety, to tell us that we are heading in the wrong direction, that it won't work. This is the space that requires the most courage. It requires us to keep facing and stepping forward. It requires us to look with interest at our emotions, acknowledge them, then thank them for trying to keep us safe... and put them to rest. It requires us to embrace an attitude of curiosity towards the journey ahead; to breathe deeply into it, to embrace it to our gut and reimagine a new identity or way of being. And it is also the space that results in our greatest growth if we choose to traverse it.